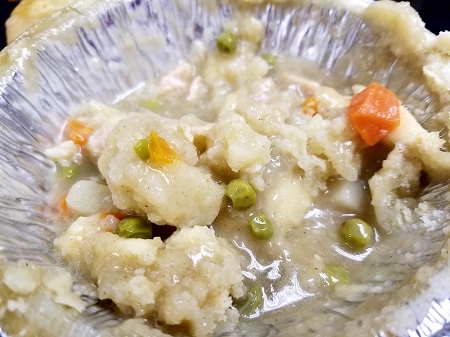 We generously add chunks of real chicken, peas,potatoes and carrots to our popular Pot Pie. We went back to our original crust to make it flakier than before.Needs to be baked. Contains Milk, Egg, and Soy 14 oz Will be available for Frozen shipping SOON! BAKING INSTRUCTIONS: . Thaw. Bake at 350 for 45 minutes or until Center reaches 165 degrees Farenheit and crust turns golden brown. This is a great pot pie! I have never have a non-GF version so I can't compare it to that, but this was wonderful. It takes a long time to make between thawing and cooking but it's worth the wait! The crust is only on top which I liked because it meant more meat and vegetables. I was able to split this into two meals. Highly recommend!